Our custom number plates are popular with motorists across West Sussex and neighbouring counties. 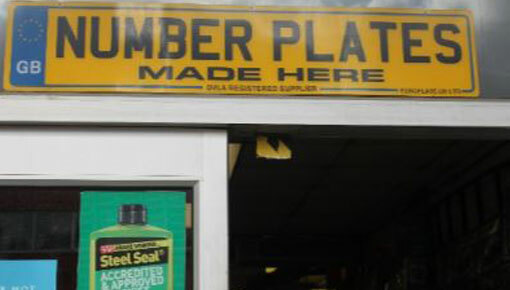 At Rose Auto Supplies, we offer a fast and efficient service for those looking to purchase a custom number plate. We create fantastic custom road legal number plates for UK vehicles. Now you can get that cool number plate you have always wanted! Offering the latest applications and printers, we can design that brand new number plate for you. Whether it is for your everyday car, your vintage car or a motorbike, Rose Autos offers a while-you-wait service which could take as little as 5 minutes! All fitting is done using self-tapping screw or sticky. We supply the fitting kits so you can fit the plates yourself. Our number plate service offers you a cost-effective solution all the time. We have a variety of buyers on our site, from those looking for something for their bedroom to those looking to replace a cracked or damaged number plate on their vehicle. Want to buy something different for a present. Are in need of an additional road legal number plate for a vehicle you intend to tow. Have a number plate that does not have the right font, size or display. Fail to have a number plate on display on either the front of the rear of the vehicle. Try to obstruct, alter or hide your number plate in any way. This includes, but is not limited to, a number plate covered by dirt. Do not have a lit number plate at night. We offer car legal plates that use the correct font, size and spacing as specified by the DVLA to ensure that you will not face any issues.